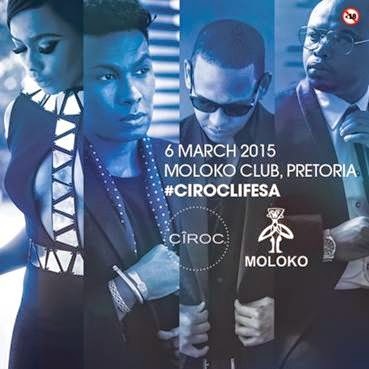 A group of four of South Africa’s most admired talents & personalities, the CÎROC Circle, will step out in style at Pretoria’s Moloko club on March 6, the third in a series of successful signature CÎROC celebrations which have included KONG in Joburg and Shimmy Beach Club in Cape Town to date. Comprising award-winning fashion designer David Tlale, celebrated presenter and fashionista Bonang Matheba, high-energy Hip Hop artist Da L.E.S. and hit-maker DJ Dimplez, the CÎROC Circle bring the charisma and style of CÎROC ultra-premium vodka to every celebration. “CÎROC is proud to be behind these amazing South African stars and we’re excited to bring the energy and luxury of a signature CÎROC celebration to Pretoria. The celebrations in Joburg and Cape Town were phenomenal and we anticipate this celebration will be an exceptional experience for all who attend,” says Avukile Mabombo, brandhouse Reserve Marketing Manager. On the night, Moloko will see Da L.E.S and DJ Dimplez get guests on the dance-floor with their distinctive performance styles and dynamic sounds. Both artists have been in the spotlight recently, with DJ Dimplez having been nominated in over three categories at the Metro FM awards for his album Zeal, and Da L.E.S having premiered his much-anticipated Dice music video off his album Mandela Money. “The last few months have been amazing – with the launch of the video for DICE and the success of my nation-wide tour – there really is no better way to celebrate than with a signature CIROC event,” says Da L.E.S. Known for its dynamic and influential clientele, Moloko specializes in offering Pretoria the best of luxury entertainment, making it the perfect location for CÎROC’s luxury, signature celebrations.